Homeowners Mel and Kathy Smith talk with Federal Emergency Management Agency personnel Trena Morse, center, and April Lipinski on Tuesday during an assessment tour of flood- and debris-damaged homes and businesses. 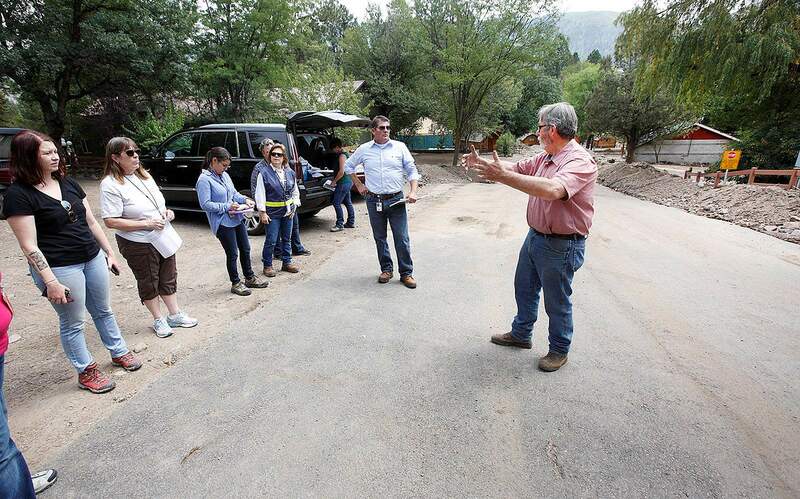 State and federal officials visited La Plata County earlier this week to do a joint, preliminary damage assessment on areas affected by flooding near the 416 Fire’s burn scar. 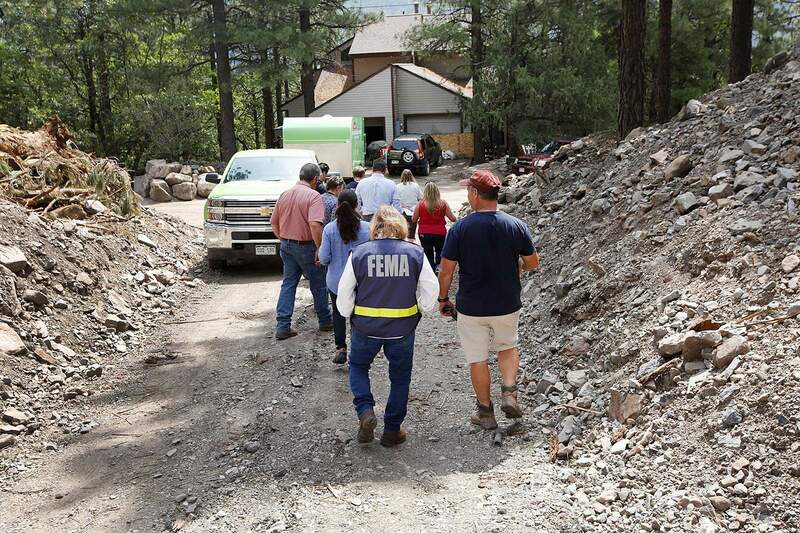 Local officials guided members from the Colorado Office of Homeland Security and Emergency Management and Federal Emergency Management Agency around places severely hit by flood damage north of Durango, including Honeyville, the Hermosa Hills Condominiums and the KOA Campground. On Tuesday, the team met with private homeowners to assess the need for individual assistance from FEMA. On Wednesday, representatives met with local officials about damage to public infrastructure, including road repairs, sewer damage and power lines. 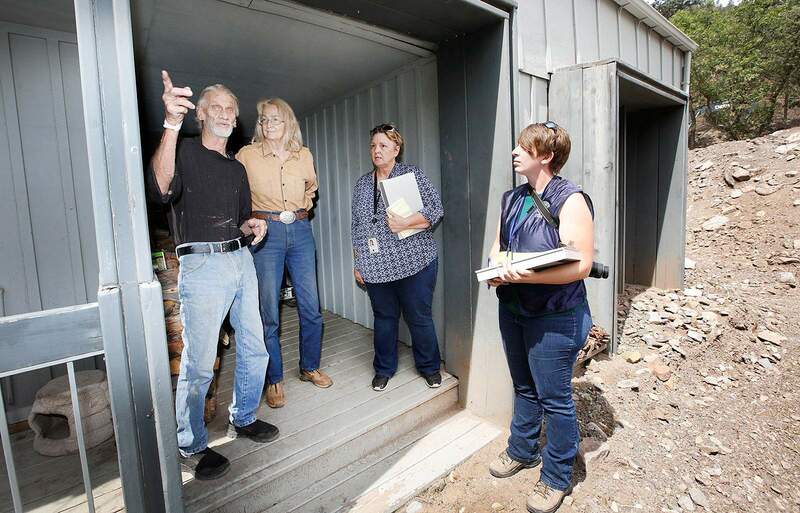 “It’s purely an information-gathering trip to see if the level of damage rises to the level that would trigger FEMA resources,” La Plata County spokeswoman Megan Graham said. 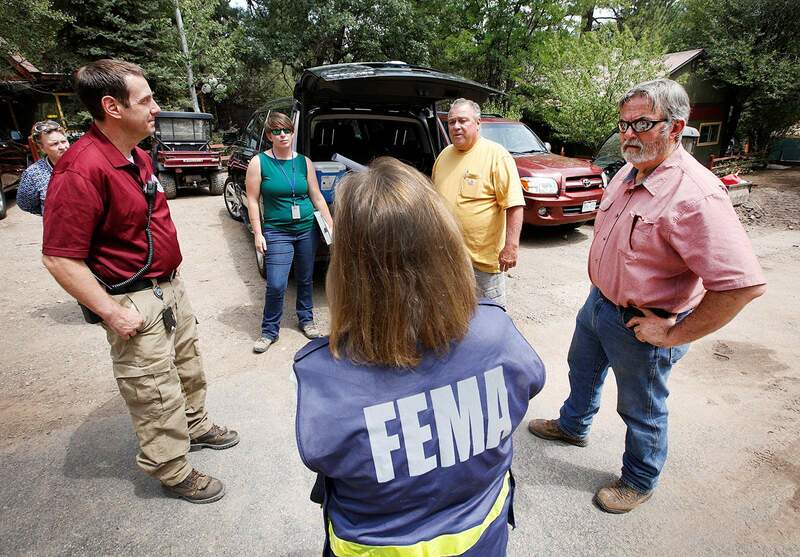 Trevor Denny, left, with the Colorado Office of Homeland Security and Emergency Management and April Lipinski, center left, with the Federal Emergency Management Agency talk with Fritz Bailey, co-owner of the KOA Campground, Butch Knowlton, right, director of the La Plata County Office of Emergency Management and Lynn Kimbrough with FEMA on Tuesday as state and federal officials took part in an assessment tour of flood-damaged homes and businesses. Five joint teams were sent across the state in response to a large storm system that affected several areas from July 23 to July 30. Ten counties are requesting public assistance. Two of those counties – La Plata County and Morgan County – are also requesting individual assistance. La Plata County was ravaged by mudslides the evening of July 24. Local officials drove team members to areas most damaged. On Tuesday, the team visited the Hermosa Hills Condominiums and the KOA Campground, where they discussed individual situations with residents. On Wednesday, the team stopped along County Road 203 and Honeyville to assess ditch damage as well as road damage to East Animas Road (County Road 250) near the KOA entrance. Though county property sustained damages during the first flooding event July 17, there was minimal damage to public infrastructure. Government relief could allow some of the local agencies to be reimbursed for overtime and equipment used. However, the damage to private property during the incident was extensive, Graham said. A lot of residents weren’t insured, meaning they would be eligible for FEMA assistance if it was granted, she said. “That possibility could present a big relief to folks,” she said. For assistance to local agencies, the joint team collects financial reports from them that document all costs associated with the storm system. Any expenses – including repairs, equipment and overtime – that cost an agency during the weeklong storm could be eligible for state or federal aid. Costs that occur after the time frame can be included in the report if they are associated with damage that occurred during the week. The team also collects before and after photos of infrastructure that saw significant damage. On Tuesday, federal, state and local officials took part in an assessment tour of flood-damaged homes and businesses. Disasters that cost more than $8 million in damages will generally move the governor to request public assistance funding from FEMA. However, a lot of other factors contribute to the decision, including overall economic impact to the community, said Micki Rost, spokeswoman for the Colorado State Emergency Operation Center. La Plata County and Morgan County are applying for individual assistance, which means there was enough property damage to private homeowners who don’t have insurance that FEMA could provide financial assistance to them. There is no specific threshold that needs to be met for local communities to apply for individual assistance. Instead, the joint team will analyze a number of factors, including number of homes affected, severity of the damage to homes, if a home is livable or not, how much repairs will cost, the insurance status of the homeowner and the overall economic impact from the disaster on the area. Butch Knowlton, right, director of the La Plata County Office of Emergency Management, describes how debris flows hit the KOA Campground. On Tuesday, federal, state and local officials took part in an assessment tour of flood-damaged homes and businesses. The joint team will present the reports and a recommendation to Gov. John Hickenlooper’s office Friday. Hickenlooper plans to make a decision about whether to request a Major Disaster Declaration on Friday afternoon. If the governor decides to request funding, FEMA does not have a timeline in which it must make a decision on his request. Though there are two counties requesting individual assistance on top of the counties’ joint request for public assistance, the governor would make one request to FEMA. Because FEMA was in the region doesn’t mean the funding will come, Kimbrough said. “Just because there were preliminary damage assessments done, I hope people don’t expect that there is going to be a request from the governor, and what that decision will be if that request were to come,” Kimbrough said. “But this was the first step, and it’s a really important first step,” she said. Graham said the county is grateful the state recognizes the area’s plight enough to do an assessment, but she doesn’t know what to expect from the determination.